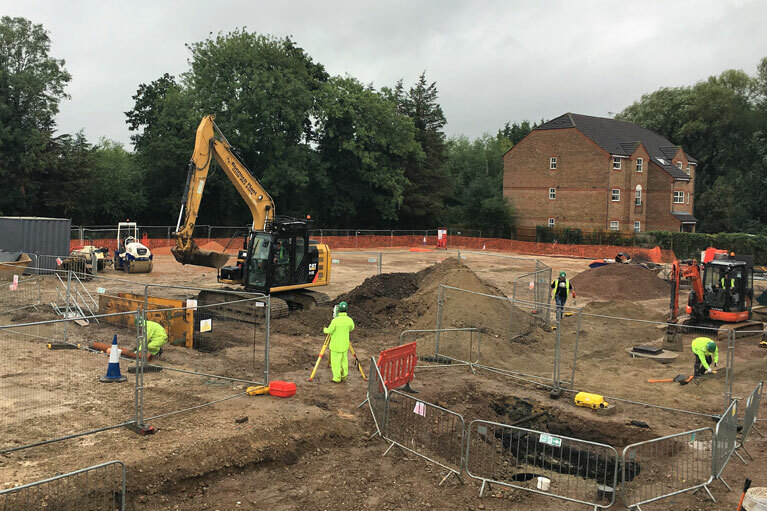 Following the decommissioning of two gasometers at this former Gasworks in Rickmansworth, Kaybridge was awarded the groundworks package of this St William development to provide 48 new residential properties over two blocks. Our works consist of the excavation, breakout and reduce levels of existing ground, grading of swales and contours, new foul and surface drainage installation to a depth of 2.5m including construction of water storage tanks, ground floor slab and reinforced concrete podium slab. Due to the former use and location of this project adjacent to the River Chess and within close proximity to a drinking well, considerate construction was required to ensure no contamination to watercourses. Monitoring of volatile organic compounds was carried out throughout the excavation works.